Paul Ryan rallied for Donald Trump, telling his audience he'd be there to campaign for "President Trump." He acknowledged his party's and his own wariness, saying, "Have we had our arguments this year? Sure, we have. You know what I call those? Signs of life." But the House speaker closed strong, shouting, "What do you say? What do you say that we unify this party at last! Let's see this thing through! Let's show America nothing less!" NJ Gov. Chris Christie channeled his prosecutorial skills to rile the crowd up with his "indictment" of Hillary Clinton. To the crowd's chants of "lock her up," Christie presented "the facts" regarding various countries—including China, Russia, Iran, Syria, Libya, and Nigeria—that had been "infected by her flawed judgment," asking the crowd after each region if she was "guilty or not guilty" for the "danger and the violence" there. He also made reference to her email problems, noting, "She deleted in four years the safety and security it took us to build in 40 years." Ben Carson opened his speech by saying he had to "state one very important thing: I'm not politically correct." He went on to warn that Hillary Clinton had been "mentored" by famous community organizer Saul Alinsky. "This was someone that she greatly admired," Carson said. "He wrote a book called Rules for Radicals. On the dedication page he acknowledges Lucifer, the original radical who founded his own kingdom," he continued, asking, "Are we willing to elect as president someone whose role model acknowledges Lucifer?" Kimberlin Brown, who has appeared on The Bold and the Beautiful and The Young and the Restless, among many others, was introduced as an avocado farmer as well as a soap opera actress. "Women for Trump" are "concerned about out-of-control, unreasonable government regulations," she told a rapidly emptying Quicken Loans Arena before the convention was adjourned for the night. Who woke up Ben Carson? Paul Ryan called the REPUBLICAN party the party of Lincoln. President Lincoln was assassinated AFTER he bolted! He formed the UNION party! He picked Andrew Johnson to be his VP! The RADICAL REPUBLICANS, their designation, impeached Lincoln's VP! President Teddy Roosevelt was shot WHEN he bolted! He formed the BULL MOOSE party. To call them REPUBLICANS is character assassination! Perfectly clear? 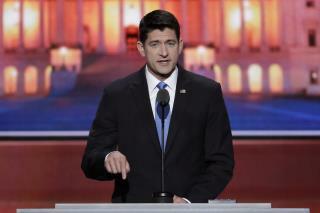 Paul Ryan gets ahead by acquiescing and never making a strong stand for what is right. He is the type of mealy mouth Republican slime that has brought the party to be headed by an lying imbecile who will make the entire country a joke like he is.